Today, the men of Camp Timberlake were blessed with yet another day of great weather here in the mountains of North Carolina! Campers woke up to a delicious breakfast of French toast and bacon followed by our traditional morning yell (our way at camp to get the boys awake and excited for the activities to come). In Chapel today, Assistant Director Dave Johnson talked to our campers about “Who is God?”, one of our core questions we try to teach. Afterwards, our day began with cabin cleanup and heading on to first period activities! In climbing today, William L. excelled on the climbing tower, climbing two routes all the way to the top. He even volunteered to show how the class to properly rappel from the top of the tower. In backpacking, Andrew S. showed great maturity helping out younger campers during 2nd period, way to go Andrew! In Mountain Biking, Reynolds J. and Carlton W. learned proper riding position and taught the class how to shift gears when going up and downhill. After a full morning of activities, everyone was treated for lunch with chicken patty sandwiches with mac and cheese and s’more pockets for dessert! After hefty helpings of food, everyone headed up to the best time, rest time, a time of the day to give the campers a good recharger for the rest of the activities later on. After rest time, our campers enjoyed their trading post with some games of tether ball and thunder ball during free time. With a good amount of rest and a just a little bit of sugar, Timberlake headed into their next activities. In team sports, Avery S. and Brenden D. excelled in learning ultimate frisbee, and dominated with their forehand and backhand in a game of ultimate. Jack B. and James B. both got their offside roll in kayaking today and everyone mastered their wet exit on the lake as well. In archery, Louis F. competed with the rest of his class and won an archery contest to see who could score the highest. Tired from activities and hungry, the men of Timberlake came down to dinner to be treated with pork tenderloin and cheesy hash browns. Once everyone got a hefty filling of food, the dining hall of campers began clapping and screaming to find out that the evening activity was capture the flag for lower cabins (Tomahawk, Little Piney, and Big Piney) and ultimate basketball for upper cabins (Stompers Knob, Little Slaty, Big Slaty, and Greybeard). An overall fantastic night of activities for all ages! Yesterday, our Seminole and Iroquois tribes also elected their tribal leaders, campers who will take on the responsibilities of leading their tribe in evening activities and toward the glory of winning the banner! For the Seminoles, Henry M. was elected Chief, Henry S. was elected Medicine Man, and Jack A. and Leyton H. were elected Lookouts. For the Iroquois, Billy B. was elected Chief, Griffin P. was elected Medicine Man, and Louis F. and were elected Lookouts. 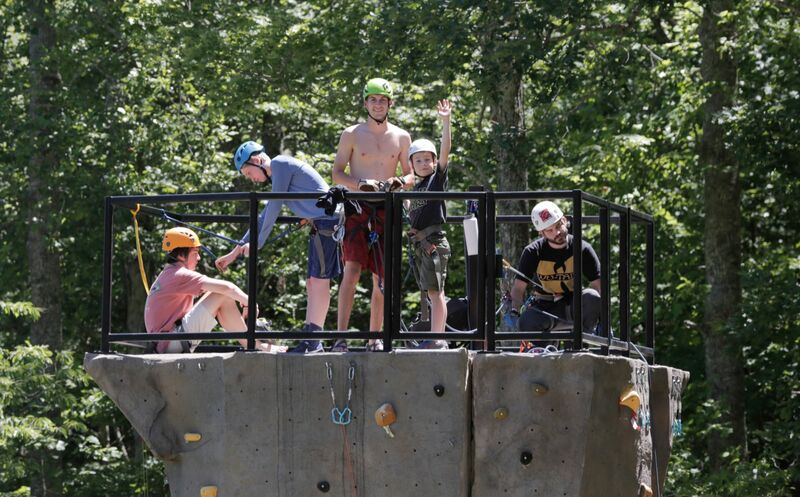 As another day at camp comes to a close, God has blessed us with great weather and ample opportunities for adventure. We pray that God continues to bless us this week and the weeks to come and that He continues to watch over us as we create friendships, adventure through His creation and continue to explore and understand his word.